Any casual observer of Philippine society wanting to know if the government is sincerely committed to improving human rights probably need only to wait and see if retired major general Jovito Palparan becomes strategic adviser to the Dangerous Drugs Board (DDB). Without a doubt it would be a backward step. The fact that it is even being seriously discussed says a great deal. Media reports from late last week have been suggesting the chief reason Malacanang Palace is interested in appointing the general to a strategic position in the DDB is because he can try and apply his ‘experience of counter-insurgency’ against the drug gangs. Well, one need only look at the human rights charges leveled against Palparan and what happened in Thailand in 2003 when authorities there similarly declared war on the drug gangs. The military were unleashed and the campaign reportedly resulted in the deaths of an estimated 2,500-3,000 people. Summary killings were rife and the campaign was roundly and loudly condemned by the international human rights community. Bizarrely, the then government of Prime Minister Somchai Wongsawat announced a similar new anti-drugs campaign late last year in Thailand. His government however fell before it got around implementing the policy. The Philippines is not Thailand – but there are creeping parallels here –one being the insidious power of the military. This increasingly seems to be a civilian government led by ex-generals as a glance around the cabinet table clearly shows. Drugs are a curse on Philippine society as they are elsewhere. An effective drugs policy needs to be developed –and that is no easy thing. But we expect government policy to be more than popular vigilantism. We don’t need the kind of justice doled out by the likes of Dirty Harry. If the government is really serious about human rights it will tackle the drug problem through the rule of law, not the barrel of the gun. Given the claims against Palparan –claims to be fair the general denies– the authorities should not be considering his reappointment to a position of power. As a simple indicator on the government’s commitment to human rights, it says it all. JUSTICE Undersecretary Ricardo Blancaflor yesterday denied allegations he received a P2.6-million to push for the release of the so-called Alabang boys from detention. Reports coming from the Philippine Drug Enforcement Agency earlier said there was a second bribery at the Department of Justice, apart from the P800,000 allegedly deposited in the bank account of state prosecutor John Resado, investigating fiscal who dismissed the drug charges against Richard Brodett, Joseph Tecson and Jorge Joseph on Dec. 2, 2008. Reports said a ranking DOJ official on December 19 took out a loan of P2,642,187.23 from the head office of Metrobank in Makati. On the same day, another person paid for the loan with P2,644,438.92, including fee and day interest of P2,251.70. In a phone patch interview over dzMM, Blancaflor said he felt alluded to by the reports and denied that he has a bank account at Metrobank in Makati. What he got, he said, was just a housing loan, which he said he could not have gotten without a bank account. “Absolutely none. Wala akong tinanggap na deposito at wala akong binayad na P2.6 million. Mali ‘yun. Kaya nagtataka ako. Walang pumasok na P2.6 million, wala ring binayad na P2.6 million on Dec. 19 or in any other time. Kahit kalian, walang pumasok sa account ko,” he said. Blancaflor said the bank account being identified by unidentified sources was actually the serial number of his promissory note for his housing loan. Blancaflor, who is still on forced leave pending investigation, got caught in the bribery scandal following the revelation of Maj. Ferdinand Marcelino, chief of the Special Enforcement Service of the PDEA, that Blancaflor called him up on December 19. Blancaflor has admitted making the call, but said he only inquired about the continuing detention of the suspects when a resolution has already been issued dismissing the charges. STATE prosecutor John Resado is not willing to open his bank accounts for scrutiny in light of allegations he was bribed to dismiss criminal charges against the so-called Alabang boys. In a letter to the House oversight committee on dangerous drugs which is investigating the alleged bribery, Resado said he was declining to waive his rights, also invoking his constitutional right to privacy. Resado, when he returned to testify before the committee last Friday, denied allegations contained in an anonymous letter that he deposited P800,000 on Dec. 2, 2008 in his account with the Banco de Oro SM Bacoor branch in Bacoor, Cavite, the same day he came out with a joint inquest resolution dismissing the drug charges against Richard Brodett, Joseph Tecson and Jorge Joseph who were arrested in September last year. The same letter said Resado’s wife also received the same amount on the same day but Resado has denied it, saying the P800,000 in his account was a revolving fund from their money lending business. “Resado is afraid that his wrongdoings will be exposed,” he said. Cuenco also said if the committee would not be able to pin Resado on bribery charges, it will use other options. He said the committee will go after Resado Al Capone style, referring to what the FBI did to the Italian-American gangster of the 1920s and 30s whose criminal career ended with charges of tax evasion. He said Resado did not report the income from the money lending business in his statement of assets and liabilities or income tax return. While I agree that Resado must be tried for any wrongdoing he did, I can not help but raise my eyebrows in mockery to the House of Representatives’ obvious maneuvering to throw in the blanket to protect the PDEA. Watching the House inquiry on this matter convinces me that the House is not inquiring about the circumstances lying around the “Alabang Boys incident”. Instead, they busy themselves on ruining Resado’s credibility and not accepting the possibility that Resado is actually saying an inch of truth. The House panel has obviously reached a verdict. They believe that GMA’s men Santiago and Gonzalez must be cleaned. And the only way to do that is to make the public believe that the PDEA and DOJ is clean white and the only dirty being is Resado. Kawawang Resado. Tsk tsk tsk! MANILA, Philippines—Although he hasn’t been asked to join the war on drugs, retired Maj. Gen. Jovito Palparan has been briefed on the workings of the Philippine Drug Enforcement Agency by no less than PDEA chief Dionisio Santiago, himself a retired general. Santiago said he could make Palparan his deputy for “special concerns” in case the controversial former military officer is appointed to the PDEA by President Gloria Macapagal-Arroyo. “We will discuss with him how best we can utilize him at PDEA,” Santiago told the Philippine Daily Inquirer Sunday in a phone interview. Santiago said he gave Palparan an overview of what PDEA does during a briefing last week. Afterward, he said, the retired general “seemed to like” the idea of joining the agency. Prior to the briefing, Santiago said President Arroyo had phoned him to tell him to expect a call from Palparan. Incoming Press Secretary Cerge Remonde, however, said Sunday Palparan’s appointment to PDEA or the Dangerous Drugs Board (DDB) was not set in stone. “It’s not yet sure so to make any conclusions at this point would be speculative,” Remonde said in an interview over Radyo ng Bayan. Palparan had been branded a “berdugo” (butcher) by left-leaning groups that accused him of being behind the alleged abduction, torture and execution of their comrades when he was in the military service. Asked about Palparan’s spotty human rights record, Santiago said he thought the retired general would do well in the fight against illegal drugs. “You give me people, I’ll utilize them and judge them according to how they will perform,” Santiago said. He said DDB Chair Vicente “Tito” Sotto III had also expressed interest in getting Palparan on the drugs board representing a non-government organization. Santiago said Palparan’s network in the communities would benefit the PDEA. He said Palparan could do “advocacy” work and warn the public about the evils of drug abuse. MANILA, Philippines—The political opposition branded as “dangerous” the statement made by Justice Secretary Raul Gonzalez questioning the inclusion of military men in the fight against the drug menace. “If Secretary Gonzalez is right, then it could be a basis for overturning all cases and convictions stemming from anti-drug operations,” opposition spokesperson Adel Tamano said. If he were a defense lawyer in a drug case, he could use Gonzalez’s statement in asking that the case be dismissed “because the case is unconstitutional. So the statement of the secretary of justice is very dangerous,” Tamano said. Parañaque Rep. Roilo Golez said Gonzalez had “sabotaged” the operations of the Philippine Drug Enforcement Agency (PDEA). “In apparently spiting an agency he now considers a nemesis, he forgot his role in the fight against illegal drugs. With him at the justice department’s helm, PDEA’s operations have been neutered,” the lawmaker said. After Department of Justice (DOJ) prosecutors dismissed the charges against drug suspects Richard Brodett Jr., Jorge Joseph and Joseph Tecson, the PDEA claimed that it had received information the prosecutors had been bribed. The agency’s allegation triggered a word war between PDEA and justice officials. Marcelino is the head of the PDEA Special Enforcement Service that arrested the so-called Alabang Boys in separate buy-bust operations in September last year. Anthony Golez, deputy presidential spokesperson, Thursday said Gonzalez’s opinion was “constructive” and in fact should prompt the PDEA to review its policy of tapping soldiers as narcotics agents. Reacting to Gonzalez’s statement, the Armed Forces of the Philippines said Marcelino’s assignment to the PDEA was covered by a circular and was in line with Republic Act No. 9165, or the Comprehensive Dangerous Drugs Act of 2002. Lt. Col. Ernesto Torres Jr., AFP spokesperson, said RA 9165 empowered the PDEA to enlist the support of government agencies and other offices, including the AFP, to support the agency’s drive against illegal drugs. A day after President Gloria Macapagal-Arroyo ordered a ceasefire between the PDEA and the DOJ, Gonzalez came out swinging again, saying Marcelino had no business participating in the agency’s operations. Gonzalez argued that as a soldier in active service, Marcelino was barred from holding another position in a civilian government agency. Torres Thursday said the deployment of Marcelino to the PDEA was covered by appropriate orders, including a circular signed six years ago by then Armed Forces Chief of Staff Gen. Dionisio Santiago, now the PDEA chief. The specific AFP regulations on the assignment of active officers to various government agencies have been incorporated into Circular No. 2 issued on March 12, 2003, according to Torres. The circular prescribed that active officers could be detailed either as an aide-de camp, a security officer or a military assistant, Marcelino’s designation in the PDEA. But not more than 0.5 percent of the total number of active officers and not more than 0.2 percent of the enlisted personnel corps could be deployed outside the military organization. Soldiers deployed to civilian offices are placed under the AFP’s Headquarters Service Command, according to Torres. “As far as the Armed Forces is concerned, our actions in detailing our personnel are covered by the circular,” he told reporters in Camp Aguinaldo. “So it means that the deployment of Major Marcelino and other officers is covered by a specific regulation of the military,” he said. The circular, of which only the first page was provided to reporters, was signed by Santiago and then adjutant general, retired Capt. Cesar Carranza, as ordered by the defense secretary. Torres pointed out that the 2003 circular was issued following the enactment of the Comprehensive Dangerous Drugs Act of 2002. Torres also cited other laws supporting the deployment of active military officers to government offices, which included President Ferdinand Marcos’ Executive Order No. 41 issued in 1966 and President Joseph Estrada’s memo issued in 1999. The memo, dated Jan. 27, 1999, prohibited the assigning of military personnel outside the AFP without prior approval of the President. Torres said the appointment of Marcelino to the PDEA post was approved by the President. He added that it was either the President or the defense secretary who approved the assignment of active officers to various government offices. “But in the meantime, government lawyers will be seriously studying the opinion verbally issued by the justice secretary,” he said. Better coordination between the DOJ and the PDEA was among the marching orders of Ms Arroyo when she declared herself the country’s “drug czar” Tuesday until the bribery controversy was resolved. MANILA, Philippines—Marine Maj. Ferdinand Marcelino’s drug-bust operations for the Philippine Drug Enforcement Agency (PDEA) could be considered “unconstitutional” since active duty military officers like him are barred from holding position in a government agency, according to Justice Secretary Raul Gonzalez. “As far as I’m concerned the acts done when you’re not authorized should not have any bearing whatsoever (because) you have no authority,” Gonzalez told reporters Wednesday. He quoted Article XVI Sec. 5 paragraph 4 of the Constitution that provides that no active military officer may be appointed to any capacity in any civilian office including government agencies. Marcelino said he was appointed to the post by Malacañang when the PDEA was beginning to build an organic staff and rise from an agency of borrowed personnel. Marcelino said he was only following orders when assigned to the agency in 2007. “Marines just go where we are told,” Marcelino told the Philippine Daily Inquirer Wednesday. The soldier, who had seen action in Mindanao, said he got the assignment on the request of the PDEA and that his detail went through the hierarchy of approving offices: The Armed Forces of the Philippines headquarters, the Department of National Defense, and finally, Malacañang. “It’s not up to us where we will be assigned. We can’t choose where we will be assigned,” he said. Besides heading the agency’s Special Enforcement Service, Marcelino is also chief of the International Cooperation and Foreign Affairs Service and the Interagency Counternarcotics Operations Network. Two other military officers, both Marcelino’s “mistahs” (classmates) in the Philippine Military Academy’s Bantay Laya class of 1994, hold key positions at the PDEA—one is acting director of PDEA’s Plans and Operations Service and the other, an army major, handles intelligence. The soldiers also handle training of recruited agents. Gonzalez said Defense Secretary Gilbert Teodoro brought up the question over Marcelino’s authority to work in the PDEA at the Cabinet meeting Tuesday in which the controversy was discussed. “Secretary Teodoro mentioned that he (Marcelino) is an active military officer (and) he is covered by the Constitution. That is a specific provision of the law. So if you would analyze that, all his acts are illegal. Unconstitutional and illegal,” Gonzalez said. It was the PDEA Special Enforcement Service headed by Marcelino that arrested Richard Brodett Jr., Jorge Joseph and Joseph Tecson—the so-called Alabang Boys—in separate buy-bust operations in September last year. Marcelino disclosed that he was offered bribes ranging from P3 million to P20 million for the release of the suspects. He said he rejected the offers. The PDEA also claimed that a P50-million bribe led to the dismissal of the drug possession charges against the suspects, prompting a word war between the PDEA and the Department of Justice (DOJ). Even as the prosecutors vehemently denied the allegation, President Gloria Macapagal-Arroyo ordered five justice officials and prosecutors to go on leave pending an “independent” investigation. “I never raised this to the President because if it came from me it would be colored. It came about in the course of the (Cabinet) discussion. It was Secretary Teodoro who reacted,” Gonzalez said. Asked if the arrest of the Alabang Boys could be considered void because Marcelino was the lead agent, Gonzalez said the matter could be questioned in court by the suspects. “That’s now the subject of investigation and it has been raised before the Court of Appeals,” he said. “I’m just saying that under the Constitution, he’s disqualified (from working in PDEA) because he’s an active duty (military) officer,” Gonzalez added. “If he wants to stay in the PDEA, he should resign from the Armed Forces,” Gonzalez said. “All the operations handled by Major Marcelino (in PDEA) could be considered invalid, unconstitutional unless you can consider that as a de facto act,” the justice secretary added. “I don’t think the President can refuse to accept that because that is the Constitution,” Gonzalez added. Told that active duty military officers were serving in other government offices, Gonzalez said this was the lookout of the heads of the government agencies involved. Gonzalez said PDEA Director General Dionisio Santiago, a former military chief of staff, could enlist the assistance of anyone except an active duty military officer. “He can enlist under him (exiled communist party founder) Joma Sison,” Gonzalez quipped. He said that at the Cabinet meeting, he confronted Santiago for failing to substantiate his claim that a P50-million bribery took place after the arrest of the Alabang Boys. Charges of bribery have become a major point of debate after Santiago himself admitted at a hearing in the House of Representatives last week that the PDEA floated the P50-million alleged bribe in the media as part of its “psy-war” tactics against the DOJ prosecutors. “That’s why they have to be properly educated on all procedures required under the (anti-illegal drugs) law,” the justice secretary said. Right at the inquest, State Prosecutor John Resado already dismissed the drug possession charges against the three suspects due to lapses in the PDEA’s arrest procedure. The dismissal of the charges was upheld upon review by two more state prosecutors and ultimately by Chief State Prosecutor Jovencito Zuño, who has strongly denied any wrongdoing in the process. In the House of Representatives, the committee on dangerous drugs is urging Marcelino to expose in public his mistah who offered him “tatlong manok (three chickens)” or P3 million to drop the charges against the Alabang Boys. “He (Marcelino) has to eventually grapple with his gut in revealing who is this classmate of his who made the proposal. This is the gap in his otherwise brilliant testimony. His continued refusal will crack his credibility,” Parañaque Rep. Roilo Golez said at Wednesday’s committee meeting. Golez’s proposal for Marcelino to reveal his mistah’s identity to the Office of the Ombudsman was adopted by the committee. Golez said that it would be better that the Ombudsman take over the bribery probe because Marcelino might have qualms about cooperating with the National Bureau of Investigation, which is under the DOJ. Marcelino revealed to Golez and other committee members the identity of his classmate in PMA Class of 1994 during an executive session last week. Senior State Prosecutor Phillip Kimpo, vice chair of the DOJ’s Task Force on Anti-Illegal Drugs, accused Marcelino of “covering up” for his mistah, saying his refusal to name him was “suspicious.” With a report from Gil C. Cabacungan Jr. If i remember it correctly, some Ilonggo personalities has their own reason to believe that the Gonzalezes are into illegal drugs. But it remains a hot speculation up to this moment. By TJ Burgonio, Gil C. Cabacungan Jr.
MANILA, Philippines—President Gloria Macapagal-Arroyo, the country’s new drug czar, has ordered antinarcotics authorities to crack down on big drug traffickers, including her supporters, Malacañang officials said Wednesday. “There will be no sacred cows,” Executive Secretary Eduardo Ermita said when asked if Ms Arroyo would run after even her political allies suspected of trafficking. Ms Arroyo on Tuesday declared that she would oversee the anti-drug campaign and serve as anti-drug czar until the bribery scandal besetting the Department of Justice (DOJ) is resolved. DOJ prosecutors have been accused of dismissing charges against three drug suspects, known as the Alabang Boys, after they allegedly received P50 million. The prosecutors, who have denied the allegation, are on leave and are under investigation. Ermita said notorious drug rings on the order of battle of the Dangerous Drugs Board and the Philippine Drug Enforcement Agency (PDEA) would be targeted in the all-out war against trafficking. Ms Arroyo expected the “big-name traffickers” to be immediately identified in the fresh campaign, and “brought before the bar of justice,” he said. Cebu Rep. Antonio Cuenco noted that only six of the 32 big drug syndicates identified by the PDEA had been dismantled as of last year. Cuenco urged the President to bring down during her stint as the anti-drug czar the 26 big syndicates on the PDEA list. “They have been identified but how come they have not been busted up to now?” asked Cuenco, vice chair of the House committee on dangerous drugs. He also urged Ms Arroyo to beef up its prosecution of drug cases in view of its poor batting average in convicting drug traffickers and pushers over the past 10 years. On Tuesday, Ms Arroyo also ordered the implementation of a raft of measures, including random drug tests on high school and college students, to curb drug abuse and trafficking across the country. “Definitely that (major victories) is the target of our drug enforcement agencies, and with the President at the helm of the drive, you can be sure that we better have some victories,” Ermita told reporters. “Otherwise this problem will linger on, and it’s to the detriment of society,” he said. An anticrime watchdog said Ms Arroyo must give her new role a “semblance of permanence” to efficiently get to the bottom of the illegal drug problem in the country. “The case of the Alabang Boys must not be the basis of the President’s timetable in assuming the post. It is just the tip of the iceberg so she must hold on to her new role for a longer period of time,” said Dante Jimenez, chair of the Volunteers against Crime and Corruption (VACC). 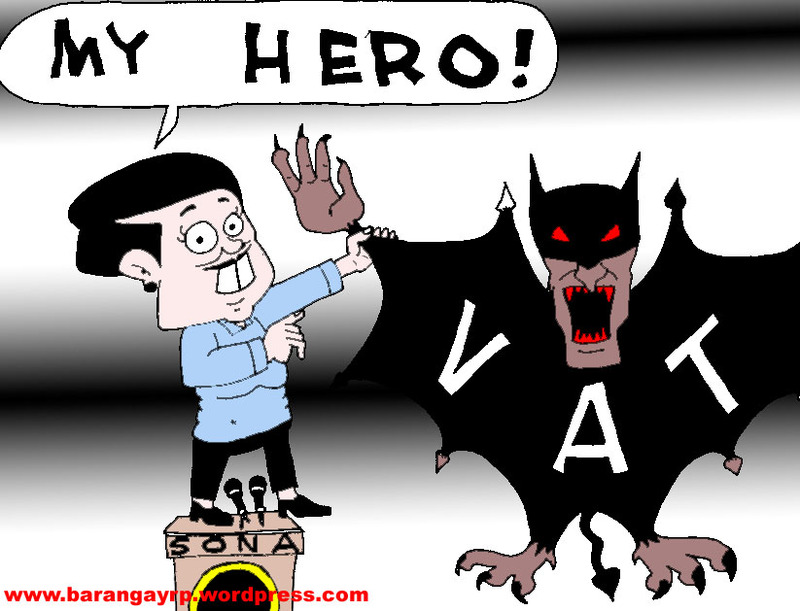 The VACC is set to pitch this idea to Malacañang in a position paper on Thursday. The decision to submit a recommendation to Ms Arroyo was arrived at a board meeting Wednesday. The group expects its position to be opposed by various groups and personalities as the elections are just around the corner. “As we all know, illegal drugs are among the best sources of election money,” Jimenez said. He noted that 80 percent of the heinous crimes in the country were drug-related. Others are not impressed by the President naming herself anti-drug czar. “It’s bad if she will be unable to curb the problem of illegal drugs in the country. She might even be tagged as a recipient of bribes,” Senate Minority Leader Aquilino Pimentel Jr. said. Pimentel said Ms Arroyo should instead give the job to PDEA Director General Dionisio Santiago. “Santiago has a good reputation and only needs a no-nonsense backing by the President. I think he will be able to do a good job,” he said. By naming herself as anti-drug czar, the President has turned into “micro-managing,” said opposition Sen. Francis “Chiz” Escudero. “That is not good for somebody who is supposed to run the government. She’s no wonder woman who could do everything,” the senator said in Tacloban City on his way to various towns in the provinces of Samar and Leyte. Escudero said similar moves in the past did not lead to results. “There is no such thing as a drug czar in our administrative code. That is only a title and not a position,” he said. He said that every time the country faced a big problem, the President would name a czar. Ms Arroyo earlier named Agriculture Secretary Arthur Yap as rice czar at the height of the rice crisis and Energy Secretary Angelo Reyes as energy czar when the country was suffering from high fuel prices. Escudero also warned of more delays in the investigation of the Alabang Boys’ case. “Most agencies in government won’t move without her imprimatur,” he said. In the House of Representatives, Ilocos Norte Rep. Roquito Ablan, chair of the committee on dangerous drugs, pointed out that the government had only made 24 convictions out of the thousands of drug cases filed as far back as 1998. Representative Ablan said the committee would come up with legislative reforms aimed at strengthening the tools of the drug war and at reconciling the prosecution and enforcement side of the campaign. The committee members suggested bigger budget allocations for the PDEA and police agents, setting up of an independent prosecution arm for drug cases, and using latest technology such as surveillance cameras to beef up cases against drug pushers and traffickers caught in the drug busts. The committee would also consider the President’s proposal to conduct random drug tests in schools. Cavite Rep. Elpidio Barzaga suggested that Congress members undergo the same tests to set an example among public officials. “How can we have an effective investigation of drug cases and legislate laws meant to address the drug menace if the public will perceive some of us as drug users?” asked Barzaga. Follow-up or Meddle. You choose. ILOILO City – The waterfront barangays of this city host shabu “talipapa” or flea markets where pushers and buyers trade the illegal substance, said City Police Director Senior Supt. Wesley Barayuga. “Instead of going to the radio, why not do something about it?” snapped Mayor Jerry Treñas yesterday upon learning that Barayuga disclosed the information over the radio. Over DyOK Aksyon Radyo, Barayuga said the shabu flea markets are in either of these waterfront barangays: Gen. Hughes, Concepcion, Monica, Zamora-Melliza, Legaspi, Veterans Village, Sto. Rosario-Duran and Muelle Loney. “(Barayuga) will be remiss in his obligation if he does not act on any information he has received. (If he) knows there is a criminal activity, why not do something about it instead of going to the radio,” said an alarmed Treñas. Trying to downplay Barayuga’s disclosure, Treñas said the city government and other concerned agencies are active in the campaign against illegal drugs in the metropolis. Barayuga should validate his information, stressed the mayor. “It needs no instruction from me,” said Treñas, who returned to this city yesterday from Manila where he attended the State of the Nation Address of President Gloria Macapagal-Arroyo on Monday. Barayuga admitted that police operations against illegal drug traffickers have become difficult, especially in the circuitous waterfront barangays where there are many nooks and crannies offering hiding spaces for the suspects. Three months ago, the Iloilo City Peace and Order Council reported that illegal drugs have infested all barangays of this city. While only 55 barangays were affected in 2007, illegal drugs have spread to all the 180 barangays this year, the council said. Treñas himself noted an upsurge in drug-related incidents in the first quarter of 2008. He directed the authorities to tap barangay tanods in the campaign against drug trafficking and other illegal activities. The Peace and Order Council reported that in the first three months of 2008, 298 individuals (excluding illegal drug users) were identified by the authorities to be peddling illegal drugs. Last year, the Iloilo City Police Office’s watch list contained only 64 names for the same period. The council is made up of six police precincts and their commanders, representatives, and officials from the city government, barangay officials, and tanods, among others. Earlier, Justice Secretary Raul Gonzalez Sr. disclosed that several police personnel and officials of the city government were acting as protectors of a big-time drug lord in the city. In December 2002, Task Force Waterfront was formed during the time of Chief Supt. Marcelo Navarro as regional police director, to address the series of criminal incidents in the area such as unsolved murders, drug trafficking, petty crimes such as snatching; smuggling and gun running, among others. The waterfront was then a notorious haven of drug traffickers, smugglers, gunrunners, extortionists and petty street criminals. The task force, right under the supervision of the Police Regional Office 6 (PRO-6), was dissolved and replaced by Compact Waterfront when Chief Supt. Geary Barias assumed as regional director of the police regional office in August 2006.